Turkey's Barbaros survey vessel has begun explorations on location in Cyprus’ offshore block 9 of the island’s exclusive economic zone (EEZ), pro-government daily Yeni Şafak reported on Saturday. "Barbaros sailed to the coastal area south of Cyprus for seismic exploration activities. It has been searching neutral gas-petrol wells for a while now in the parcels that South Cyprus claims itself despite Greek harassment,", the website said. 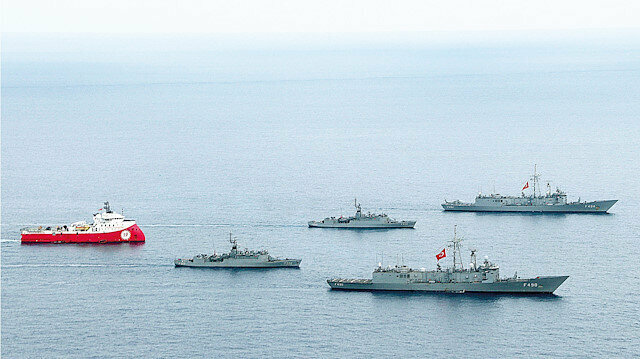 The Turkish ship is accompanied by two frigates and two corvettes, according to Yeni Şafak. Political and military tensions between Turkey and Greece have escalated sharply since December 2017, when Turkish President Recep Tayyip Erdoğan said it was time to renegotiate an early 20th-century treaty that marked out the two countries’ common borders. Turkey and Cyprus have stepped up their efforts for gas exploration and drilling over the last half of 2018, while Ankara and Nicosia have been at odds over Turkish Cypriot’s share in gas revenues and Turkey’s territorial claims that overlap with Cyprus’ EEZ. Sismik araştırma gemisi “Barbaros Hayreddin Paşa”, gaz aramak için Kıbrıs’ın güneyine indi. Doğu Akdeniz’deki bu bölge Rumların tek taraflı ilan ettiği münhasır ekonomik bölgedeki 9 numaralı parseli de kapsıyor. Mayıs ayı sonuna kadar bölgede kalacak Barbaros, KKTC adına Türkiye Petrolleri’nin aldığı ruhsatla faaliyet yürütüyor.